When I was younger we had a summer-house in Nantucket — an old, traditional, grey-shingled structure that had been pulled by draft horses from its original location nearly a hundred years before. It was full of light, smelled of old wood and dust, and had something vaguely unsettling in the attic. It abutted a conservation field that was clogged with milkweed, yellow spiders, clover, scrub pine, poison ivy, ticks and blackberries. I liked Nantucket then. I had summers of absolute freedom — no one watching over me, no one telling me where to go. I would cruise the Island with my friends, peddling my Schwinn Stingray to beaches where the tourists didn’t go or into town to eat sugar crusted doughnuts and clam chowder with a pat of butter in the center. We’d hitchhike to the larger “surf” beaches; throw frisbees and play games of paddle ball, the “tok-tok-tok” of an endless volley echoing off the dunes. We body-surfed in the rough water and later licked our tanned arms for the taste of salt. We caught sea robins, snapper blues, eels and porgies off a public dock, sometimes selling our catch to the same fish markets from which we bought our bait. There were two cheap movie houses which we frequented — terrifying ourselves with the psycho-sexuality of “Dressed to Kill,” and becoming vaguely confused by “Heavy Metal: The Movie.” In the space of two days we watched Mad Max six times. Starving after a morning on the beach, we took a shortcut through the tick-choked field to a hippy-run organic store that sold avocado, cheddar and chutney sandwiches on herb bread and a brand of natural chip (probably made of spelt, carob and tahini) that my parents judged chemical-free enough for me to eat. As I got older, I abandoned the Stingray for a Puch Moped to which we’d travel to “locals-only” beaches. We bought beer and peppermint schnapps with our “Disk-O-Mat” employee IDs caged on 8th Street (the drinking age was 18 then, so us hairy 13-year-olds managed to pull it off). We shoplifted like mad-men, stealing useless tourist goods, Penthouse magazines tucked into the Sunday New York Times and packs of Reed’s root beer candies. We smoked cigarettes and thin joints of Jamaican bush weed. In the late twilight, we enjoyed sloppy, sandy kisses with girls named Laney — our lips sticky with Southern Comfort. We bought cast-off 60s and 70s leisure wear for a quarter at the church bazaar and listened to the Circle Jerks and Malcom Mclaren’s Duck Rock out of our spray painted Boom Box. My mother, always a wonderful chef, cooked for summertime like no one before or since. While she made the most out of the island’s fresh seafood — thick swordfish steaks, delicate bay scallops — I loved the simplest things the most: pearly white corn, fertilized in the fields with fish heads, that popped effervescent between your teeth, bowls of tiny, new potatoes, dressed simply in butter, dill and cracked black pepper. Sorel grew like weeds in the sandy soil and my mother made pots of soup out of the tart leaves, enlivened by a dollop of sour cream. We would go to the farm stand every other day to pick out fresh produce — amazingly the stand was operated under the “honor-code”: You weighed what you bought and left money in a coffee can. Even in the height of my kleptomania, I never disrespected that code, not even with one marble-sized potato. If I close my eyes now, I can still see the summer sun, dust motes dancing in the rays, illuminating a plate of Spaghetti with home-made pesto, the marble-sized potatoes and green beans. Warm tomato slices with olive oil and salt. There is still no meal so near to my heart. My parents sold the house when I was fifteen. I never returned to Nantucket, and from what I understand the island, while still beautiful, has become over-crowded in the summers and transformed by wealth that eschewed the under-stated and flinty lifestyle of the old W.A.S.P. families who had first vacationed there. I hadn’t thought of Nantucket for a very long time. Then, peddling my bike to the subway station, I saw bunches of corn for sale by the farm near our house. This was beautiful corn, white and firm and stacked in groups of three. A price was written on cardboard with a metal box, waiting for an honor-system payment just as in those old, Summer days. I paid, took it home, and served it that night. I followed my mothers methodology: shuck corn, place in cold water with a bit of salt and a teaspoon of white vinegar. Bring to a boil. Turn off heat, cover and let sit for five minutes. The corn was achingly fresh, the kernels popping with the sweetness of summer sun. Over the last weeks, I have picked up garlic, red leaf lettuce, daikon, giant tomatoes, zucchini blossoms and bags of baby potatoes. 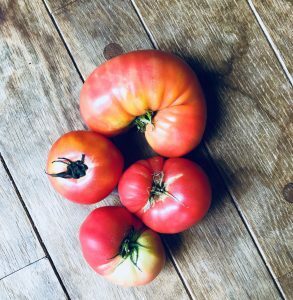 While not everything was as good as Nantucket farm stands, or the glorious produce of my beloved Prince Edward Island, it made the summer come alive to drop those coins into a metal box and see dried soil at the bottom of my bag as I unloaded my groceries. It was a surprise to me how agricultural Tokyo remains. I live in the Nerima ward (“ward” being equivalent to New York’s boroughs)and some — like those who derided Brooklyn and Queens as “bridge and tunnel” in my youth — might call it suburban. But, to me it is still 100% urban with dense and crowded shopping streets and a certain sophistication. Even so, within a few minutes of my house there are at least 5 or 6 commercial farms — highly compact, very hi-tech blocks of greenhouses and open fields, providing the city with fresh produce year-round. In fact, Nerima is famous for its produce — particularly the size and quality of the daikon radishes pulled from its fertile soil. There is nothing equivalent to it in New York. In the long time-line of Japan, Tokyo is somewhat of a young city. It came to prominence during the Edo period (1603- 1868) when it grew from a sleepy fishing village (named Edo) into one of the most populous cities in the world. It further gained in prominence in 1869, when it became the imperial capital of Japan and was re-named Tokyo. The city was made up of 23 wards which were divided into two sections Yamanote and Shitamachi. Shitamachi encapsulated low-lying, downtown Tokyo — it was the heart of the city, sophisticated and urban. Yamanote, at a higher elevation, was home to the wealthier classes and larger, undeveloped agricultural lands. (Later, in 1943, Tokyo incorporated 30 municipalities in the western part of the prefecture and numerous outlying islands.) These old divisions still loom large in certain people’s memories. A friend of mine, who grew up in the crowded, very cosmopolitan Nakano neighborhood (Yamanote) recalled some business dealings with an old couple who ran a tin factory in Nishi Nippori, in the heart of shitamachi. As they negotiated, my friend began to notice that the old couple were subtly teasing him, talking down to him a bit. Eventually they laid it out straight, Nakano, in their memory, was a place of rice farms and in their mind my friend was but a country bumpkin struggling to understand the complexities of big-city Tokyo life. I, for one, am glad that within the huge mega-city that is Tokyo, the country bumpkin still exists. It makes things human, in a city that is growing more and more sterile and automated, to be able to drop those coins into a rusty, metal box and bring home a tomato — sweet and ripe, twisted into the shape of a kidney. It speaks of a history that is cherished and vital, tying together those old Edo roots to the shiny, mega-malls dotting the skyline. At the end of the day, the farms of Nerima are but one element that keeps Tokyo grounded as the city itself sprints into the future, always in danger of forgetting itself. My name is not Lucy but, well. Love your writing, and passion for food and romantic nostalgia. Great writing. I feel very lucky to have been in that house during those amazing Summers. Your mom did a wonderful job cooking the tiny fish we brought back as well. Also, I find it impossible to eat pesto and not think of her. I completely get this!!! My mother’s birthday is August 4th. One of my greatest food memories is steeped in the same ethos you describe. Several years before she died, my sisters and I converged on her home for her birthday. It was peak season for produce from the farm I had a share in, and so I packed the car with Jersey’s best tomatoes, red and golden beets, Swiss chard, basil, and produce royalty, Silver Queen white corn. The corn is from a family farm stand, decades old and boasting nigh familial loyalty amongst its customers. It is on a neither here nor there stretch of road approximately half way between Pennington and Hopewell, New Jersey. The Kerr’s operate it seasonally, and even as the incursion of development oozes out from the towns repurposing lovely farms to create more McMansion gated communities, they, thankfully, show no sign of going off into that great good night. My mother was a caterer, and at that time both of my sisters chefs in Burlington, Vt., so the feast of surpassing freshness served up that night, simply prepared without ostentation to showcase the rich farm to table flavors, and crowned by that sublime corn, was a glorious unforgettable meal. People, especially food people, pressed to name their favorite all-time meals surprisingly often place the actual food served second to the occasion, the setting, the company— indeed the very things that make the communion of breaking bread such a spiritual event. Great meals can’t be eaten alone! So, that idyllic summers night, shared with my beloved family, and some anointed as family, the drink, and the food created a night of such joyous elation— every contributing note pitch perfect— that it may be the most perfect meal I’ve ever eaten.